Spasticity in Greek means “pulling”. Spasticity is a condition where a number of muscles suffer continuous contraction, stiffness, and tightness. It is caused by lesions in the pyramidal tract i.e. UMNL (Upper Motor neuron lesion). Spasticity is characterized by spasm, especially the tonic spasm. This kind of stiffness or spasm interferes with the speech, normal movement and gait. Spasticity is uni-directional, i.e. the resilience to motion is only experienced when the joint or a muscle makes a move in some particular direction. Spasticity is a common symptom of a demyelinating disease called as Multiple Sclerosis (MS) and is termed as muscle stiffness. In this disease, the neuron cells of the brain and spinal cord suffer damage. Spasticity is dependent on velocity i.e. it can be noticed with fast movements. What are the causes of spasticity? It is also caused due to the progressive degeneration of myelin and the nerve fibers.Myelin is a fatty white substance that envelops the axon of nerve cells, forming an electrically insulating membrane. Spasticity also takes place due to contraction of the extensor muscles and the flexor muscles that causes pain and weak coordination. What are the symptoms of spasticity? Hypertonicity i.e. rising muscle tone, that causes stiffness, rigidity and dysfunctional bladder. Deformity causing difficulty in walking, moving and speech. Abnormal positioning of arm, wrist, fingers, and shoulder. It is defined as a state of stiffness, inflexibility, and inability to bend, stretch, twist or any deformity under pressure. Rigidity is also known as muscle tension or rigor. Rigidity is mostly bi-directional, i.e. resistance to movement in muscles is felt regardless of speed and course of direction in which the muscles and tissues exhibit their motion. Rigidity can be seen in extrapyramidal lesions, (part of the motor system causing involuntary actions) for example Parkinson’s disease. Parkinson’s disease is a progressive neurological disease which affects movement. What are the causes of Rigidity? Wilson’s disease (Autosomal recessive condition inherited of copper metabolism in lungs, liver, brain and other tissues. DMD (Dystonia musculorum deformans). This is a disease where painful muscle contractions cause exaggerated distortions. MNS (Neuroleptic-malignant syndrome). This is a life-threatening disease. It is described as idiosyncratic reaction toneurolepticmedications. Catatonia (State of unresponsiveness to external stimuli). CJD (Creutzfeldt-Jakob disease i.e. fatal brain disorder). Gegenhalten (involuntary resistance to passive movements). What are the symptoms of rigidity? The state of stiffness, inflexibility and inability to bend. Spasticity commonly affects muscles of legs and arms, neck. Eyelids, face, and vocal chords. It can be also said that spasticity involves only one muscle group i.e. Flexors. Rigidity can affect any muscle of the body, i.e. both Flexors and Extensors. Symptoms of rigidity include stiffness, inflexibility of muscles, cramps, mask (fixed facial expression), inability to write and clothe buttoning, trouble to get up from a chair or bed and pain. 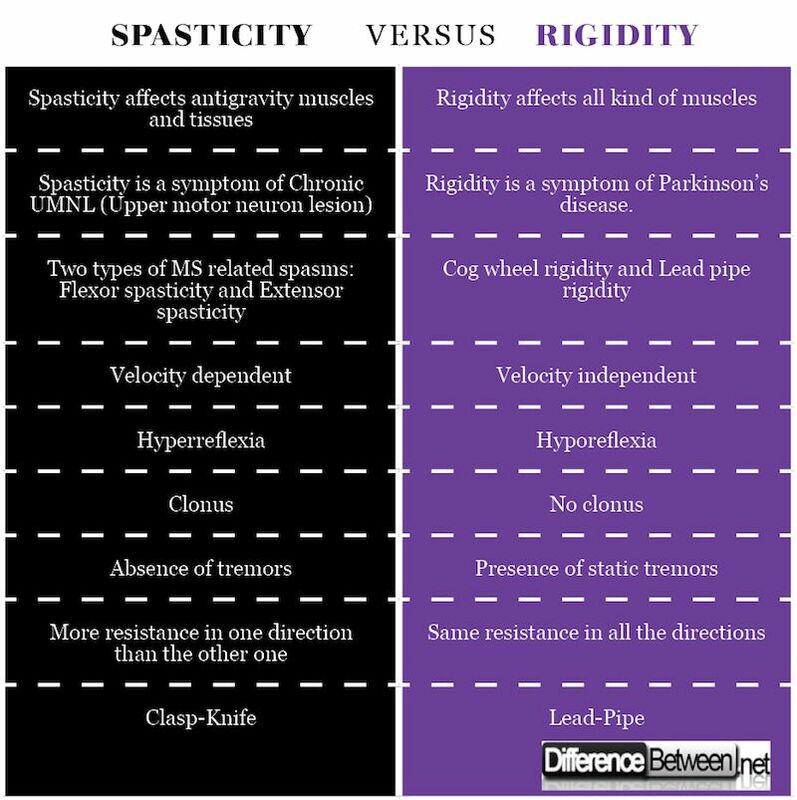 Spasticity depends on velocity. This means that spasticity is more noticeable with fast movements. It exhibits abnormally high muscle tone due to the excitability of the stretch reflex. Rigidity is not dependent on the velocity of the movement. 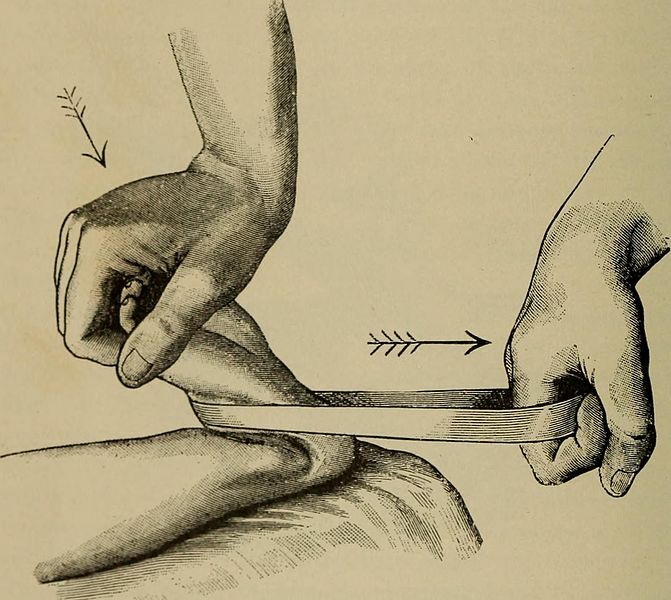 In this, the resistance of a joint is unaffected by the speed of movement of muscles. Spasticity is found in pyramidal tract lesions (Upper motor neuron lesion). Rigidity is found in extrapyramidal lesions, (i.e. parkinsonism) like the rubrospinal or vestibulospinal tracts. Spasticity covaries with Hyperreflexia. Hyperreflexia is a condition in which involuntary nervous system shows a disordered response to external stimuli. It is caused due to spinal cord lesion or injury. Rigidity covaries with Hyporeflexia. Hyporeflexia is a condition in which there is weak or diminished reflex in reaction to some external stimuli. Two common cases of resistance to movement are spasticity and rigidity. Both of them demonstrate hypertonic conditions, however, their causes, symptoms, and attributes differ. These two states are elicited while examining the tone of muscle limbs. Spasticity features include clonus and increased reflexes while as the features of rigidity include mental state, alertness, and emotions. Dr. Amita Fotedar -Dr. "Difference between Spasticity and Rigidity." DifferenceBetween.net. February 15, 2018 < http://www.differencebetween.net/science/health/difference-between-spasticity-and-rigidity/ >.